Maybe if I ever wrote a book or compilation of Marketman’s favorite recipes, I would divulge it then. I didn’t stick to the original recipe completely. I did little tricks that I thought would result in a more flavorful and richer cake. 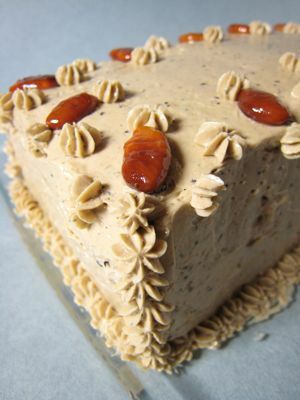 Yet would hopefully retain the essense of a light coffee cake with the flavor of homemade mangosteen jam. IIt may be audacious to call it Mangosteen Cake “a la Marketman” but if I ever publish it, I will credit the original recipe that gave birth to this version. If you happen to find the original recipe from that cake company, let me clue you in to some of the changes I made… I used fresh milk, not evaporated, I used dayap juice instead of vinegar to make the buttermilk equivalent (and I think this was an inspired move), I used a lot of canned (a la Brunn) butter on purpose (as opposed to fresh butter) for a richer flavor, and of course, nearly double the amount of mangosteen jam called for in the original recipe. And since I made the jam myself, it is somewhat less watery than commercial versions, and intensely mangosteeny. I also cooked it in a loaf pan instead of a flatter cake pan, hoping to retain moisture. The result? Superb on the first try if I may be my own town crier… It was so good we ate an entire loaf before it even cooled or was frosted. It would be perfect with some coffee or tea, and frankly, I liked it naked, without the frosting. Not too sweet (how can that be with so much jam? ), light and flavorful, it was a real home run. One has to carefully fold the eggwhites into the batter to ensure an evenly colored cake. The one thing I would like to improve is how to spread the mangosteen jam throughout the cake as it has the natural tendency to sink to the bottom, it being heavier than the other ingredients. And we found out a little too late that the cake tastes better AFTER it has cooled, with the mangosteen flavor seemingly more intense than when it was fresh out of the oven. 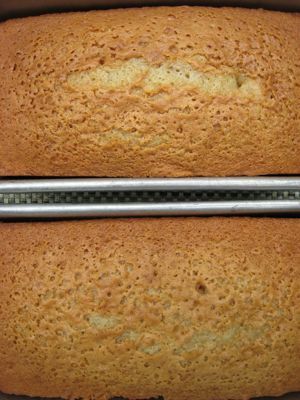 Turned over the frosted, the mangosteen solids would be near the surface of the cake, perfect. All I could say wow and amazing! It is a real mangosteen cake and mangosteen loaf and excellent use of jam! A cake loaded with jam! WOW,MM! That was really cool. I look forward to your sharing the recipe someday. . . I hope you come up with that cookbook real SOON. . .that cake is just calling my name! Does anyone have any idea where I can purchase mangosteen jam? I visited several Asian stores here in Seattle with no luck. Mangosteen, Lanzones and Atis are always available at Seafood City here in the SFO bay area. They are imported frozen from Thailand however and does not compare to the fresh ones from P.I. and the prices are outrageous, i’ll just save the money and vacation back home ;-) As for the mangosteen jam, i have not seen them sold here yet. Are these fruits fresh or frozen? I bought frozen Lanzones from Ranch 99 last summer and it tasted horrendous! I also saw some old and brittle looking Mangosteen and the looks alone was already a turn off. Yuck. 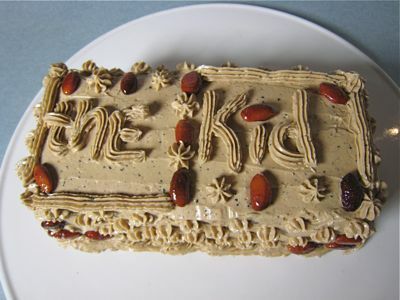 The Kid — good job on the cake! 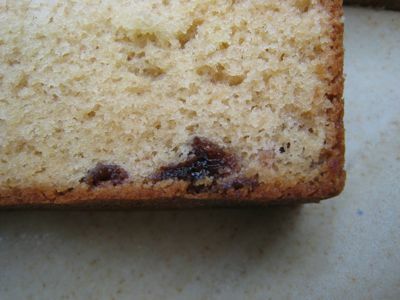 MM, you mean those brown bits from your cake are actually mangosteen seeds? Thought they were almods ;-) I didn’t know mangosteen seeds are edible, wow and i’ve been spitting them out when i eat them before. Beautiful cake MM! Mangosteen and dayap – two of my favorite flavors -that was really inspired! Mila, barako would work in moderation, a bit more dayap for flavor enhancement, and chopped caramelized pili nuts would be a superb topper. Frankly, my icing tasted a bit Goldilocksy, if you get my drift, but it still tasted good… The cost on this cake wasn’t a big factor as I had the jam, but if you had to buy the bottled jams, it would skyrocket if you were generous with the jam… overall, a great “local” flavored cake! Once again I am inspired to try to bake this cake unless of course you are inclined to sell? I think I would prefer the cake without the icing myself too. Am taking a chance here so expert bakers please don’t shoot me down, but could you incorporate flour with the jam before mixing it into the batter so it wouldn’t sink to the bottom? I do this with my chocolate chips and nuts when I add to cake batters and it helps a little. Or would that change the consistency of the jam once baked? I was also thinking, what about trying a sour cream coffee cake recipe then instead of the regular streusel, (brown sugar/butter/walnuts/flour etc. 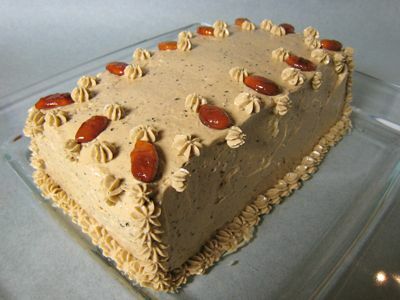 mixture) that you have on top and swirling through out the cake , replace with a concoction of the jam, instant espresso and maybe pili nuts or any other type of nut you think would taste good. You think that would work? Wow! Cake and coffee! MM, what about a topic on coffee! Splenda can be a better alternative. I had seen a cookbook using Splenda on its recipes at Costco. My friend tried using Splenda in her puto and it taste good. Why not try using Coco sugar? It’s supposed to be good for diabetics and and those who are on a diet since it falls in the low range of the glycemic index.. and it’s all natural compared to chemically-based Splenda..
looks very interesting and yummy. I do not bake and I have on intention to burn the hiuse down as of yet *lol* But I would love to try Pito’s Mom’s Mangosteen Cake and maybe coerce my uyab to bake a version for me haha. I love coffee and I like fresh mangosteen (have not tried jam yet) so this looks like a good combination of the things I love. Looks absolutely luscious! MM, Mangosteen trivia- the number of “petal-like” raised ridges found at the bottom of the unopened mangosteen fruit equals the number of edible endocarp (white “segments” called aril) of the fruit inside. Check it out! Learned this from a friend in Davao during a visit to a mangosteen orchard while eating mangosteen freshly picked from the tree– the best!!! By the way, would you know of any good commercial mangosteen jam? I got so interested on it. Thanks. nancy, kablon farms has a decent version, I eat that when I don’t have my own. They sell it at the food section of tiendesitas near C5 and at Market!Market! in the section with fruits/plants outdoors. Eileen, yes, how interesting… I think I also read about this phenomenon in an article by Mickey Fenix several months back… cool. Oh when oh when will you publish the book????? I bake more cakes than I do pies and I would so love to try this. I just bought a couple of mangosteen jam from Kablon in Market2 and this recipe came up! This would definitely go well with my perfectly brewed benguet coffee. edel, it is less dense than an almond and softer, but after stewing in so much sugar, it actually tastes more sweet than anything else… no… it isn’t particularly reminiscent of a langka seed. elaine, I haven’t even made the first move to a book, it just seems so overwhelming/daunting. That looks good. I can only dream for now of baking or even tasting mangosteen cake. As Ted mentioned above, frozen mangosteen is available at Seafood City but they are gross. Once you’ve thawed to fruit to eat, it already tastes “lata” or bulok. Hello MM! Your cake looks absolutely gorgeous! Now here’s a cake that gives my mom a run for her money! Heehee. But honestly, the recipe isn’t a huge secret and my mom has actually shared it with many of her friends through the years. She bakes & sells her cakes today mainly for her enjoyment. (The cake only became “commercial” when my brother Pito offered it occasionally in his food court stall.) So thank you MM for your propriety and sensitivity. It is very much appreciated. However we donâ€™t want to deprive MM readers the opportunity to learn to bake a great cake. So please share your recipe. I have tried many of your kitchen-tested recipes over the holidays and my family’s very impressed and loved them all. I will be one of the many who will surely buy your book. 1. I would incorporate the jam after creaming the butter and the sugars just before adding the flour and the liquid ingredients. Downside to this…depending on the color of the jam, the cake will acquire a much darker color than the coffee. 2. After whipping the meringue, I would take a portion of it and add it to the jam to lighten the consistency. When to two batters are more or less the same consistency, then it is just a matter of folding the jam lightened with a bit of meringue giving it a swirled effect. 3: After scooping or pouring the cake batter into the pan, make sort of a TUNNEL …not too deep on the surface of the cake. then ever so lightly, transfer the jam filling the tunnel. As the cake bakes, it will not sink into the cake bottom. The cake batter will rise to the surface enveloping the jam. You can do this method the same way like pouring half the cake batter into the pan. then small DOBS of jam placed at random. Then cover with the other half of cake batter. I am not an expert… the solutions I have offered are the results of many years of trial and error and those I have acquired through the guidance of my mentors…I salute them and am eternally grateful!!! Thanks Bettyq for sharing your tips about incorporating the jam into the batter. 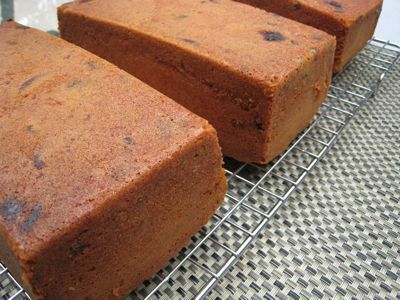 I’ve tasted Onie’s mom’s Mangosteen Cake, and it was pretty good.. as in memorable..
I’m sure MM, that your version would be memorable as well..
MM….do you know of any Food Processors there? We used a lot of fruit compounds like passion fruit, pear, mango,etc. where I used to work. So, if you know of anyone there who has the know how to produce mangosteen compound…there’s a LIGHT BULB MOMENT for them…. Been dreaming of Onie’s mom’s cake, so I went back to this page. I’d love to try that mangosteen cake. Have never tried one. Looks so yummy. Wild Strawberries From The Foothills of Mt. Kanlaon! Phat Pho Opens February 12, 2014 at Serendra!